There are a few appliances that should not be missing from any kitchen. People may do without a coffee maker or a kettle but not having a microwave can make things so much harder. In fact, almost every American household has a microwave. There is a false concern that microwave heated food is not safe but in reality, microwave ovens do have a really good safety record. Their most common use is to heat up food. Heating up food is not as easy without a microwave. Not to mention that not having a microwave means no microwave popcorn or other dishes made specifically for the microwave. In reality, most people do have a microwave in their kitchen. But like every other thing, sometimes they break down or they get old and need to be replaced. A new microwave oven is much more efficient than an old one from 10 years ago and it is much more reliable. A good microwave oven needs to have built-in cooking presets, good capacity and it must be energy efficient. These days we can find so many different microwaves that it can be extremely difficult to settle to just one model. They now have tons of features, have multiple functions, work as regular ovens, can roast and do many other things. Surprisingly they are also quite affordable at least for the mid-range models. There are also some quite expensive microwave ovens and some might be willing to spend extra but for the sake of diversity we picked moles from all price ranges. Without any further ado here is our recommendation for the top 10 best built-in microwaves in 2019. 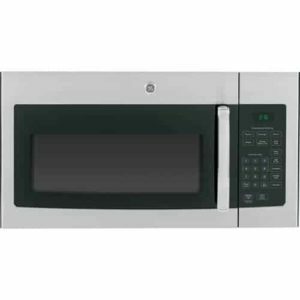 The GE JVM microwave oven is a good option for the ones that are looking for a compact model without compromising on capacity. It has a 1.6 cubic feet capacity and an easy to clean interior. The model has all the standard function including auto and a defrost feature. To make it easy to incorporate into a cabinet, the microwave has been equipped with a two speed venting system. The microwave is made with a stainless steel enclosure and touch sensitive controls on the right side. The GE JVM195 is one of the larger microwave ovens that managed to get into our list. It is a simple model with a capacity of 1.9 cubic feet and a simple but modern design. The microwave has a touch sensitive control panel along with a small LCD display that shows the timer. It comes with a matte black finish that prevents it from collecting fingerprints and a small see-through window. 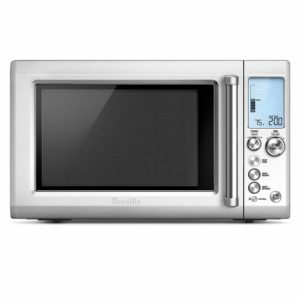 The rated power of the microwave is 1000 watts and the unit itself weighs 62 pounds. The Breville Quick Tough microwave oven is a decent premium model that comes with some interesting features. It has a special cook function that can automatically adjust the power in order to cook the food in a specific timeframe. It also has a sensor that is supposed to smartly reheat food. The model has a stainless steel housing and metal physical buttons. Unlike other microwave ovens, the Breville has a very large screen that shows more than enough information. Panasonic NN-SU696S is a great pick for the ones that are on a budget. 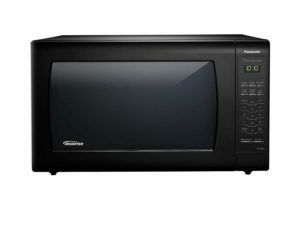 This inexpensive microwave oven manages to offer a decent capacity in a very compact form factor. It has a 1.3 cubic feet capacity with a brushed stainless steel front and a large see-through window. The model features large easy to read buttons and an LCD screen showing the timer. In terms of features, the over has a quick reheat function, 7 built-in programs and a defrost option. 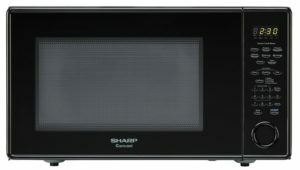 Sharp countertop microwave oven will serve best the ones that are on a tight budget. It is an inexpensive model with a sturdy construction and all the regular features. It has a 1.8 cubic feet capacity and a rated power of 1100 watts. The model features a Precise Cook Sensor that automatically detects when the food is cooked. It also has an auto defrost feature and a large 15 inch carousel. The microwave can be found in 3 different colors including white, black and stainless steel. The dimensions mentioned by the manufacturer are not accurate. The microwave oven is a bit larger than stated. It is a large unit as is and many might have trouble finding a place for it especially since in reality is a bit bigger. 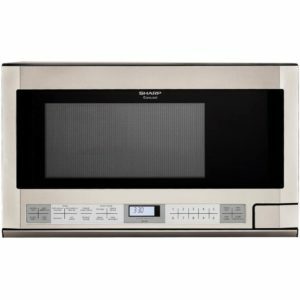 Fareberware classic microwave oven is one of the more affordable options in our list and surprisingly it is a decent product. The model has a 1.1 cubic feet capacity and a rated power of 1000 watts. Similar to other microwave ovens, the model has multiple power levels and built-in programs. It can defrost and it can heat up food. The model also has a rotating turntable and an easy to clean interior. As for size, the microwave is quite small and has a brushed stainless steel finish. 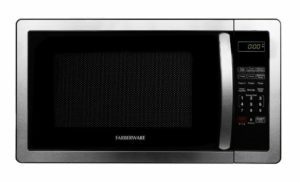 The microwave oven from Farberware is quite loud compared to other ovens from our list. It seems that the air exhaust is extremely loud. This is because the way it is designed. Could have been better and some might not even get bothered by this. 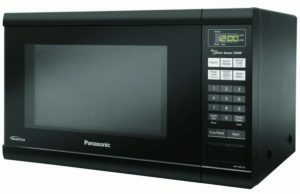 Panasonic NN-SN936B is an excellent pick for large families. It is one of the largest microwave ovens in our list. The model has a capacity of 2.2 cubic feet and a rated power of 1250 watts. For this particular model, Panasonic used Inverter technology that improves the cooking power of the oven. It also features an automatic sensor that adjusts the power depending on the food that is being cooked. Last but not least, the model features 9 cooking presets and a small LCD screen that shows the timer. A capacity of 2.2 cubic feet sounds good but there is a downside. A large capacity microwave oven also means that it is quite large. In fact it is one of the largest in our list. This is something to keep in mind especially when trying to find a place for it in the kitchen. 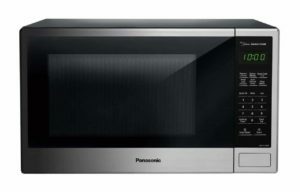 Panasonic NN-SN686S is a great and inexpensive microwave oven with a premium construction and a decent capacity. 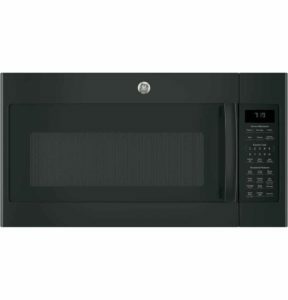 It is a 1.2 cubic feet microwave oven with a stainless steel finish and a large glossy black window. The control buttons are placed on the side and are tough sensitive and offers 10 adjustable power levels. As for cooking programs, the oven has 14 different presets as well as a defrost and reheat function. Last but not least, the interior is very easy to clean and has a large 13.4 inch turntable that can be removed. The reheat function surely is useful when it works properly. Apparently, the sensor does not work all that well. It tends to over-cook the food instead of just keeping it warm. The issue is caused by how the sensor is tweaked and this is done only by the manufacturer. 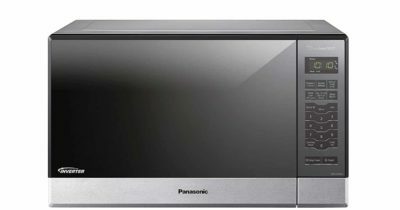 Panasonic countertop microwave oven if one of the latest models released by the brand. The model uses their patented Inverter Technology that promises even cooking and defrosting. 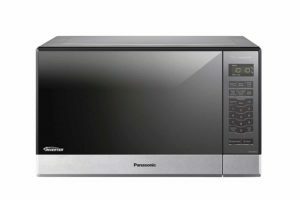 According to the model specifications, it is a 1200 watt power microwave oven with a 1.2 cubic feet capacity and a very easy to use menu. The model also has a smart sensor that can adjust the power and timer depending on what is being cooked. Last but not least, all the controls are touch sensitive, intuitive and easy to use while the interior has an easy to clean coating. The mechanism that keeps the door closed could have been designed better. What most will notice is that opening the door is easy but closing it requires a lot of force. The user needs to push hard in order for the door to snap into place but fortunately the door is sturdy enough. Capacity: This is one of the most important characteristics. It refers to the interior space of the microwave oven. It should not be too big and underpowered or small but too powerful. Food might get overcooked or undercooked. Power: The wattage of the microwave oven determines how fast it can cook. Surely, most microwave ovens allow the users to adjust the power for different levels of cooking. Built-in cooking programs: There are a lot of dishes that can be cooked with a microwave oven and some models even make it easier by having built-in presets for certain dishes.